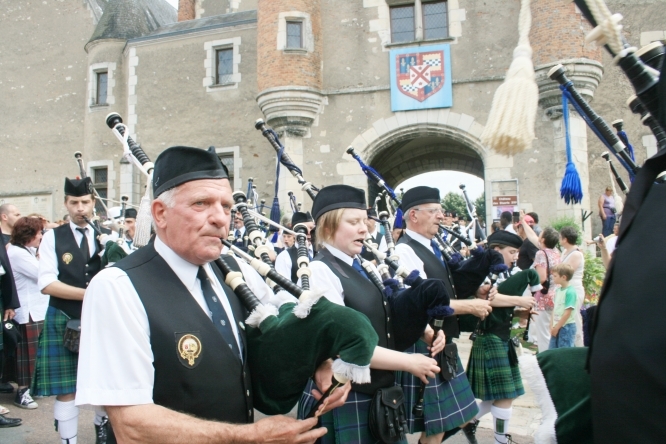 Bagpipes, tartan, kilts and Highland Games take over Cher town Aubigny-sur-Nère, each year around July 14 to celebrate the town’s special relationship with Scotland. More than 100 volunteers help organise the Fêtes Franco Ecossaises which draws 30,000 visitors from all over the world and looks back to a time when Aubigny-sur-Nère was Scottish. Deputy mayor François Gresset said: “We celebrate the friendship between Scotland and France that goes back to the Hundred Years War, when France was fighting England, and five thousand Scots came to help King Charles VI who had just been defeated at the Battle of Agincourt in 1415. “They were followed by a further 10,000 men and were led by John Stuart of Darnley. The Fêtes started in 1990 and are becoming more popular. Its twin town, Had­dington, East Lothian, also sends its pipe band to play with the Aubigny pipe band which started in 1993. “There is plenty of Scottish music, games, a market, a huge feast, where of course haggis is on the menu and on Sunday clans gather in their tartans and parade through town. This year’s event is on July 13-15.